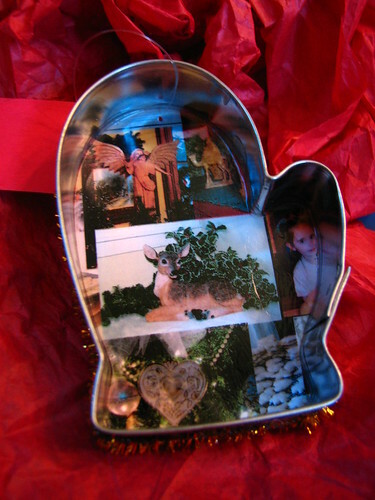 A few years ago, I made these cookie cutter ornaments for the Christmas Notebook ornament exchange. They were pretty easy to make. I found a cookie cutter collection at Wal-Mart that had twenty cookie cutters for only $5. To begin, I prepared the picture background. I explained how I made it in this Decoupaged Ornaments Tutorial. 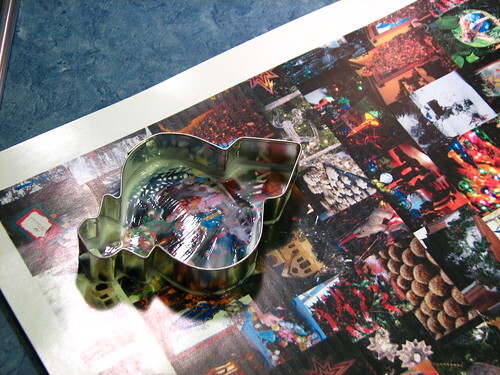 For the decoupage ornaments, I printed pictures on regular copy/print paper. 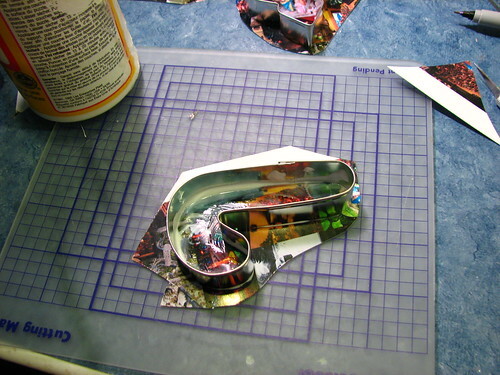 For the cookie cutter ornaments, I used photo paper, though printer paper in a heavier weight than copy paper would work. 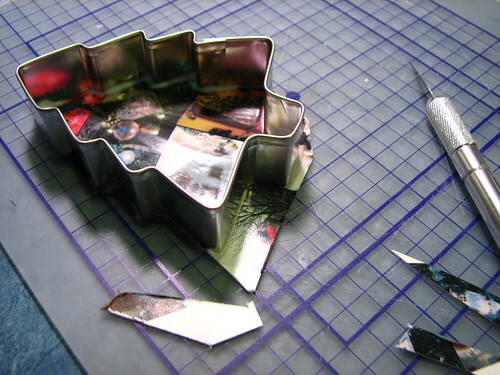 To begin the ornament, place the cookie cutter on the picture, choosing the pictures you want to show. 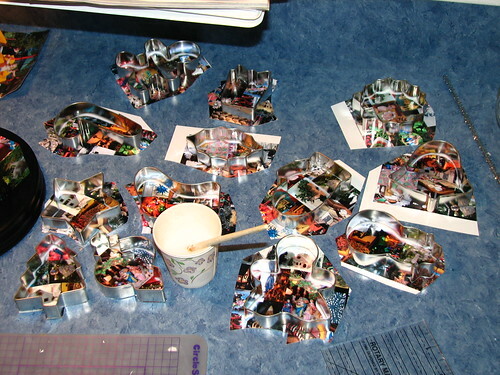 Using Mod Podge, glue inside the cookie cutter, all around the edge, then paint the Mod Podge over the pictures to seal them. 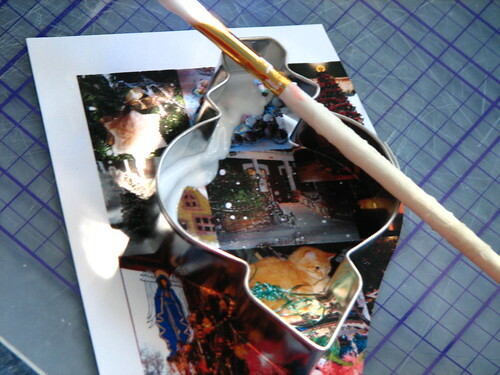 After allowing the glue to dry, cut around the ornament. Use an X-Acto knife to cut away all the paper outside the ornament. I used tinsel pipecleaners to put a decorative edge around the outside of the cookie cutter. 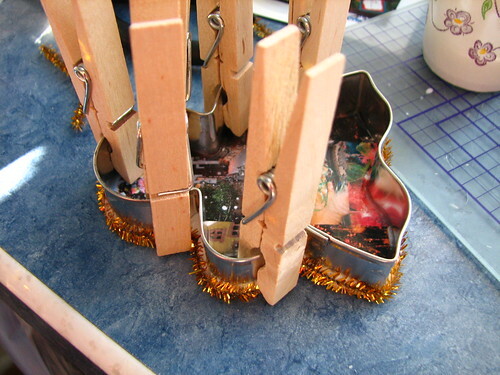 Clothespins make great clamps to hold the tinsel in place until the glue is dry. They turned out very well. 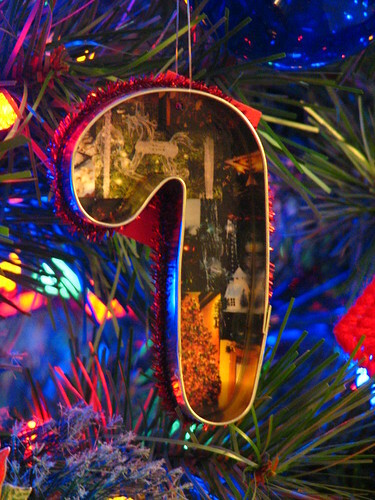 Of course, this same technique can be used for a single picture in each ornament. Maybe pictures of your kids’ childhood Christmas pictures. Or copies of vintage family pictures. Or pictures of your favorite Christmas cookies! 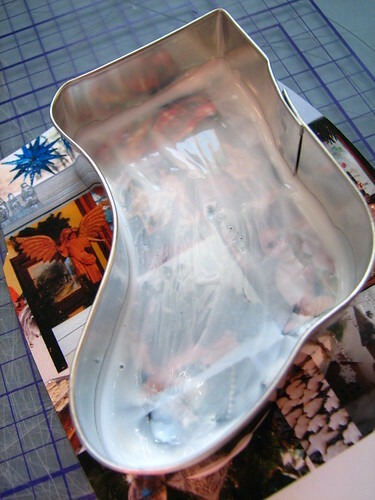 Scrapbooking papers can be used instead of pictures for a less personal look. They would be pretty tied to packages or given as gifts. You could even use Christmas fabric. How about Christmas carol sheet music inside a bell shaped cookie cutter? Or recycle Christmas cards by using your favorites as the picture backings. This entry was written by ~~Rhonda, posted on August 13, 2014 at 2:58 pm, filed under Christmas, ornaments. Bookmark the permalink. Follow any comments here with the RSS feed for this post. Post a comment or leave a trackback: Trackback URL. Love the ornaments! Very cute idea!!! I really love this idea!I might make some for my parents with pictures of us as kids or of their dogs..Dunno which yet.